We’re passionate here at Ron Gordon Watch Repair of New York City about the Rolex brand. It’s probably the #1 brand that people bring into the shop, as they’re looking for Rolex watch repair in New York City. If you asked the average person, or perhaps the average New Yorker, to name a luxury watch brand, chances are that he or she would say, “Rolex.” People know Rolex. In fact, Rolex is so popular that it’s – unfortunately – probably the #1 pirated brand as well. We’ve had quite a few people ask about “how to tell if a Rolex is fake,” for example. That said, if you step back a moment and look at Rolex, you’ll see that the company does a great job marketing the brand – making it synonymous with luxury. And, because of it’s brand marketing, it can help you with your own personal brand. Nothing says style or luxury like a Rolex watch on the wrist of any man or woman at a fine New York party. Here’s an example of Rolex marketing at work. In 1953, Rolex partnered with Swiss scientist Auguste Piccard, and his submersible vessel Bathyscaphe FNRS-2, which descended an incredible 3100 meters into the depths of the ocean. 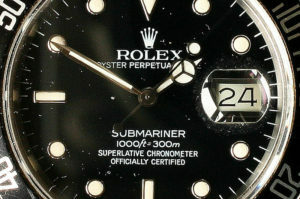 Piccard attached a specially developed Rolex, equipped with a luminous dial and Rolex log, to the hull of his submarine. Of course, the Rolex worked perfectly. And, that same year, Rolex introduced its first Submariner, water resistant to 180 meters. The watch had a matte, black dial, large luminous markers and luminous hands for the hours, minutes, and seconds – useful for any “work” underwater. It also had a knurled rotating bezel with clear markings in five-minute incredments and an arrow-shaped zero marker with a luminous dot pointing towards the center. Rolex christianed the watch, “The Divers’ Friend.” You can learn more about the Rolex Submariner, here. Let’s return to marketing. So this marketing adventure substantiated Rolex as not only a beautiful watch but a functional, high-performance watch. If a watch could endure this sort of tough treatment, then it can certainly function as a Rolex watch at New York parties and events, couldn’t it? Indeed, even if few of the people who owned a Rolex Submariner actually went diving – or did so only sporadically – the “cool” of the watch brand would certainly extend to them as individuals. It’s smart marketing, after all. Nowadays, we see this sort of marketing all the time as big brands partner with sports events and sportsmen / sportswomen who “wear” their brand and thereby cultivate a “brand image.” Red Bull comes to mind with its extreme sports events, but it should be noted that Rolex was really a pioneer in this type of marketing. Oh, and another insight. Rolex was one of the early pioneers at partnering with Hollywood stars. Sean Connery wore a Rolex Submariner in the movie ‘Dr. No.’ (Watch it on YouTube, here). Few have the good looks and cool of Mr. Connery, and – again – his personal brand and the synergy with Rolex went a long way towards substantiating the Rolex watch brand as a brand for the cool. Of course, if you have a Rolex and want it repaired, we’re the #1 Rolex repair center in New York City. Reach out to us for help with your Rolex.